Do you know if it is possible to use the domain mapping plugin if the domain I’m mapping to is an ‘ADD ON’ domain, instead of ‘PARKED’? I believe this is because photos.com is an add-on domain in my hosting, not a parked one. I really wish I could use it like this, but with correct links. Did you did it? Found a solution? Hello, I also wanna do the same thing as Guto G.
Please give us some advices. I think everything gets fixed by going to “Sites” administration, “Edit” your site, and filling in the “Settings” tab the “Siteurl” and “Home” fields with your mapping domain. And make sure that in “Domain settings” (http://site.com/wp-admin/network/settings.php?page=dm_admin_page) you have disabled the option “Redirect administration pages to site’s original domain”. If not, you will be redirected to “photos.site.com/wp-admin” when you go to “photos.com/wp-admin”. And since you has changed the “Siteurl” and “Home” values to “photos.com”, you will not reach the admin pages when redirected to the subdomain “photos.site.com”. BTW, Otto, I think this piece of explanation should be in any of your tutorials (here or in WordPress plugins) as you tend to think that doing all the mapping stuff will be enough for the images and everything taking the right URLs, and that’s not true. … in order to get the right URLs for the uploaded files. 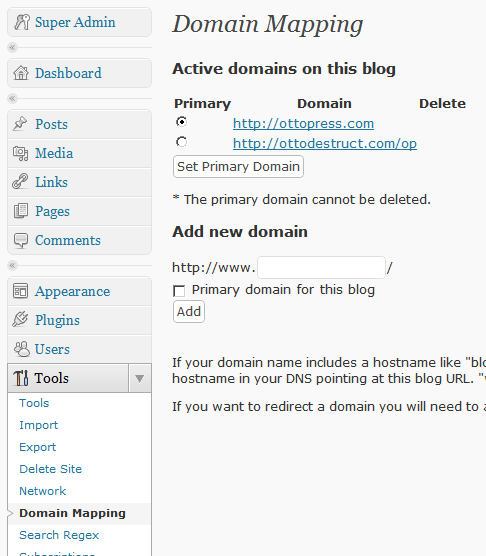 I’m using WordPress MultiSite with the insanenly helpful domain-mapping plugin. It works like a charm, but the login to the admin dashboard (both as a normal editor and as a global administrator) takes extremly long. It takes up to 3 minutes to login. I’ve tested it on Firefox and IE. Hey Otto, I need your help! I am using WP for (website A). I just purchased a 2nd domain (website B) and am trying to create the site in WP, yet am having trouble. I try to ADD NEW under sites, yet WP automatically includes website A in the new site address link. How do I get around this? websiteA.org is NOT a part of the new domain, yet I can’t remove it or am given another option when creating the site name. I tried the Domain Mapping plugin, but it did not work. So I installed WP again and created a new login, etc., though it wouldn’t let me use my websiteB.com domain b/c I already used it as a domain add-on. So I added a sub folder (websiteB.com/dir) & it worked. Then I had to go back into my 1st WP account & redirect the domain (website B) to the new link with the sub folder. Craziness! You’d think it would have been an easy solution. I wish I had never did the domain add-on to begin with & just installed & created a new log-on, etc, but that’s what my host & wp forums said to do. Two days of my life was spent figuring this out, but thankfully now I have two working websites!! I could delete them both & start over, but I don’t want to risk the site not working again & going through the hassle a second time. Just so you know Christiane, the process you eventually had to do, it the exact process that was outlined in this and other tuts. You must of missed that. Mapping my two child sites worked great… thanks for the comprehensive directions! I would also like to look into mapping my primary (parent) site to a different domain as well. There does not appear to be a way to do that via the WP admin area. Ideally I’d like to simply map a new domain to the primary site rather than go through the steps of changing the primary domain in the database. I have succesfully bound some domains to subsites in a multisite setting. I cannot do this with the plugin? Any example on how to do this with .htaccess? @phil G. Can you explain how you did it? I’m using wordpress 4.4 and subdomain multisite. But the domain mapping won’t work. It always says “Please uncomment the line define( ‘SUNRISE’, ‘on’ ); or add it to your /var/customers/webs/zenorm/wp-config.php”. But actually I’ve already put the define (‘sunrise’, ‘on’); in the config. Need help. Thank you in advance. I am still facing the issue. Do we still have to follow the same guide for WordPress 4.0+ versions. I am trying to do the same and create a subdomain like in http://10th.iresultsnic.in/. Can you please help me out? Same guide, same instructions. Works just fine still. I had this same issue. Moved the Sunrise line up above the WP multisite blurb and it works now. So I figured it out. I had to park the domain as well as add it to my hosting. I would like to be able to access the bushmanrock.co.zw site at that address but end up with the following in the address bar: http://gemmazim.com/bushmanrock/ and an error 404 page? When I tried using your plugin I get the message that it can only be used for a multisite installation from the root folder, I realise this is far from my current setup, but was hoping you had a couple of suggestions or workarounds that might help out? hi.. I have installed the multisite successfully, and installed the domain mapping plugin. A very powerful plugin, thanks a lot. However, as shown in this cropped image: http://awesomescreenshot.com/0f95mdl3a3, I don’t see where to add an domain as part of the multisite. I have set a domain parked. The current domain: good.com (multisite primary domain). The subdomains of good.com, e.g., sub01.good.com and sub02.good.com work extremely fine. I can add the parking.com here, yet, it is NOT showing in the MySiteLIst of the Networks, and it only jump to the Primary domain: good.com. Is there anyone could help me out here, please? I have set the IP address, and deleting the Server CNAME domain. yet, I still see the additional domain jumps to the originally set primary domain. Therefore, the suggestion of the above setting is not working. I have parked the otherdomain.com at the same hosting server as the multisite.com, and pointing the otherdomain.com to the root folder of the multisite.com. It seems to me that the otherdomain.com is not working correctly. Could any one there help, please? I am happy to share with people who might need. This video shows exactly how to do it. The 1st one shows how to install the Domain Mapping Plugin. The 2nd one shows how to create subdomain as part of the multisite. The 3rd one shows how to make a subdomain into the expected domain to be installed in the multisite. I am still facing the problem. Do we still have to follow the same guide for WordPress 4.0+ versions? I already try one of my karnataka sslc blog named: http://karnatakasslcresult2016.in/. Please let me know how to fix it. Also, how do i see all of my mapped domains? I do not have this super admin that you refer to. Have setup multisite and created my A records in my VPS.net Control Panel. The admin area of both the main site and “docs” sub domain work fine. My issue is that when I try and visit http://docs.example.com I simply get a white page with no content. If I disable the plugin, visiting the sub domain redirects to the main website http://www.example.com. I am the Admin of all site in WordPress. 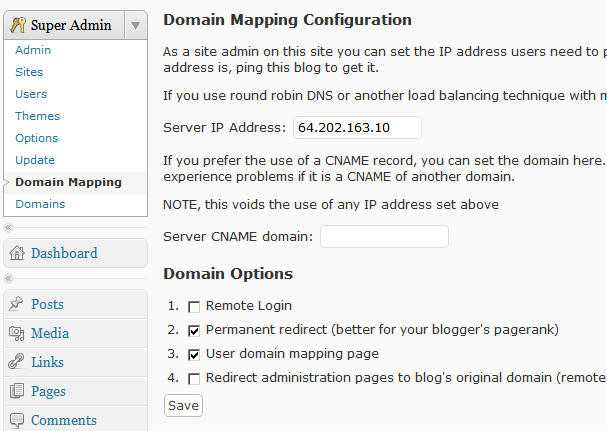 I set domain mapping using the second method through the Admin of all the sites dashboard > Settings > Domains. I can see the map in Sites. However, when I use the new domain name that I just mapped to the old domain name it doesn’t work. Rather than get the site, I get a WordPress create your own site page. To fix this, I also completed the first method you mentioned for mapping, I logged into the site and in Tools>Domain I saved my new domain name as primary. Now the new domain name pulls up the site that my old domain name used to. So, it looks like this is a two step process and not one. I have to set new domain name in both places, but it seems setting the new domain name on the site itself has a higher authority than setting it via the Admin panel of ALL sites. Why? When I delete the map from the Admin panel of ALL the sites, I still can’t access the site cause it’s still mapped to the new domain name from inside the site under Tools>Domain. Is it a mandatory two step process? Or did I mess something up and really only need a one step process? Second, once I got the new domain name working, I am no longer able to access the site’s dashboard through the Admin Panel of ALL sites. How do I access the dashboard again once it got a new domain name? I too am having an issue with not being able to access the dashboard/backend of the subsite once a new domain is mapped to it. Like HELPME, I activated the domain using Tools>Domain on the subsite rather than Admin >Settings > Domains. When I attempt to go to the subdomain’s dashboard, either through a link from admin or via newdomain.com/wp-admin, I get the login screen, but it doesn’t accept the login credentials of any user associated with the site, not even the Super Admin. What’s wrong and how do I fix it? Is there a fix for the instance when you haven’t correctly pointed the domain and as a result your site has ‘disappeared from the realm of mortal man’?! Hi, where should i install a single WordPress multisite instance in order to use the plugin? The main site has to be on the root of the domain. It cannot be in a subdirectory. Thank you Otto. I moved the installation to the root of domain and now i am facing another issue. I try to add a new domain mapping, i receive “Domain Add” after save but i dont see the mapping entry below the new domain (site id – domain – primary – edit – delete). This is exactly what is happening, so I assume all of the configuration on that end is just right. But still the plugin won’t let me add the domain to the list. I might add it a hundred times, but it simply won’t go. The domain list is always empty. Any idea what might be the issue? HI. I have just set this up for a multisite installation I have created. So I understand that someone can have a domain name and map it to one of the multisites I have created. Great tutorial, followed all the steps, but I get a ‘403 Forbidden’ page when I try to open the newly mapped domain. What can the cause be? I get the same problem too. I think the critical piece of information missing from the tutorial is add a second site. After a couple of hours futzing around I tried adding a sub-directory site in desperation. Presto! It can be mapped to the second domain name!!!! Bottom line: Do not assume everyone’s installation already multiple sites. My client site is using this plugin for multisite. I have created new standalone WordPress for the new site, both under same hosting and same domain. May I know how can I redirect the existing site to /cwph but hide the cwph directory part? I want to enable Wildcard, but all subdomains other than one, for example, office.domain.com, include this file. What is the recommended way? I’ve done this as a guide, however my own domain name still does not work even though I was pointing IP to the IP Server. When browsing the browser domain only shows that this domain has been pointing to the IP Server but does not operate as a subdomain in Network Multisite. What additional settings do I need in Cpanel? one of the things i did to make my multisite work after following all the instructions above was to create a wildcard subdomain in my hosting account and also in my registrar for my dns. i am not endorsing the following hosting company but the guide helped me. the dns wild card needs to point to the ip address for the hosting company where your main wordpress site is located. if you dont have an ip address youll need one and your hosting company wont let you then you needs to changes hosts. Hi, I have a very very basic knowledge about wordpress and website. 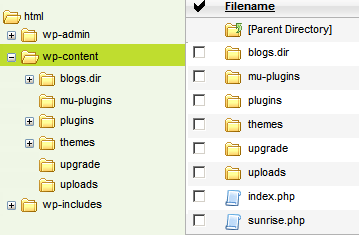 I follow this tuturial and every thing works fine until I put the domain_mapping.php file in the new folder mu-plugins. Site crashes can not acces wp-admin anymore and error 500 occurs. What do I do wrong?